Is Professionalism in the Workplace #1? So I was reading through the latest survey data to come out on world of work trends, and I came across this information from the Center for Professional Excellence from York College of Pennsylvania. 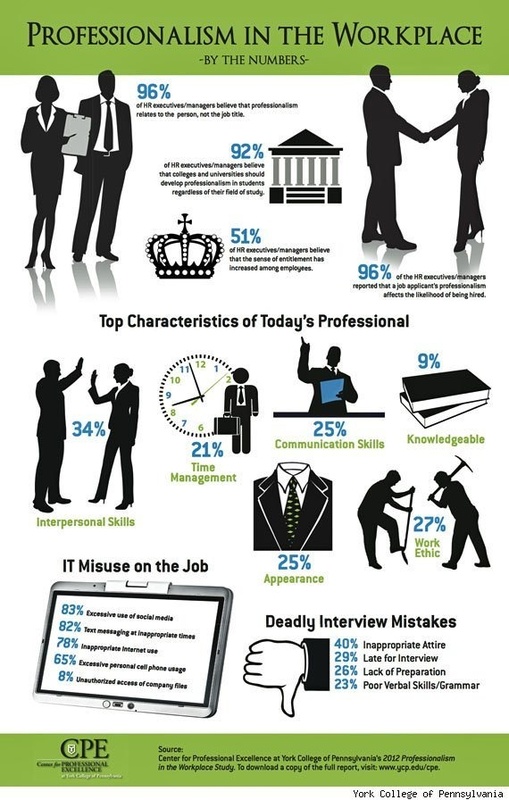 After surveying about 400 HR professionals, this infographic shows an overview of their results. What struck me the most was the “Top Characteristics of Today’s Professional” section. With “knowledgeable” sitting at the bottom of the list, I found that an interesting stat, particularly if you apply that in the tech sector, which is crying out daily for more and more knowledgeable talent. I wonder what the stats would look like if you interviewed key decision makers and not HR. Where would knowledge rank then? At least above appearance (I hope)?